Kaikai, in Tok Pisin, means “food.” People often refer to the traditional Papua New Guinean meal as “gaden kaikai” because the majority of Papua New Guineans subsist mainly on what they grow in their own gardens. 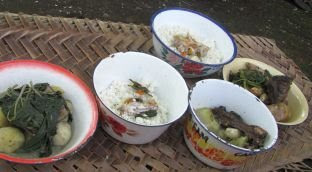 Pictured above is a meal that we were served at a funeral while we were living in the village. On the left you see a bowl of what looks like potatoes. They are actually a variety of sweet potato; topped with greens (specifically, young pumpkin leaves). That is a typical meal for many Papua New Guineans. They will boil sweet potatoes, cooking bananas or taro in coconut cream or water, and top them with boiled greens. They may or may not have meat, such as chicken, wild game, fish, or on special occasions, like this funeral, pork. You can also see that they have rice. In our experience, Papua New Guineans love rice. But for most people, rice is somewhat of a luxury because they have to buy it. However, some people are now learning how to plant dry land rice in their gardens. For the most part, we enjoyed garden kaikai, though we found it a bit monotonous, being spoiled as we are by the variety we are used to at home. But Papua New Guineans are wonderfully self-sufficient. They may get a paying job in town for a time, but if they tire of having a set schedule or of not being their own boss, they can always go back to their land and work their gardens. Most places in Papua New Guinea are not prone to drought or similar problems, and so living off of the land is a pretty secure lifestyle. Hi Susan and Brian!! It's aunt Kim.... I think this is a GREAT idea! We missed you at Christmas, but I loved the DVD Sharon shared, and love the email's and stories. I will come to your blog often to see what's new. You two are so blessed to have this wonderful opportunity to start your together life and share with your kids and grand kids! Much love to you both, you're missed, God Bless!! I love the blog! Please keep up on stories, even if they seem ordinary to you guys it is great to hear about daily activities.